Sassy on the outside, sweet and mellow on the inside! Pastel colours and tropical plants form an abstract design that is perfect for the light-hearted spirit of summer. This refreshing print will have you feeling rejuvenated every time you hit the water. So, grab your mesh bag because it’s time to hit the pool for some summer fun! The Sunkissed Mesh Bag has been designed by AMANZI Swimwear. AMANZI (a-marn-zee) meaning water in Zulu, is an Australia sports swimwear company specialising in chlorine resistant training swimwear for competitive and active swimmers. 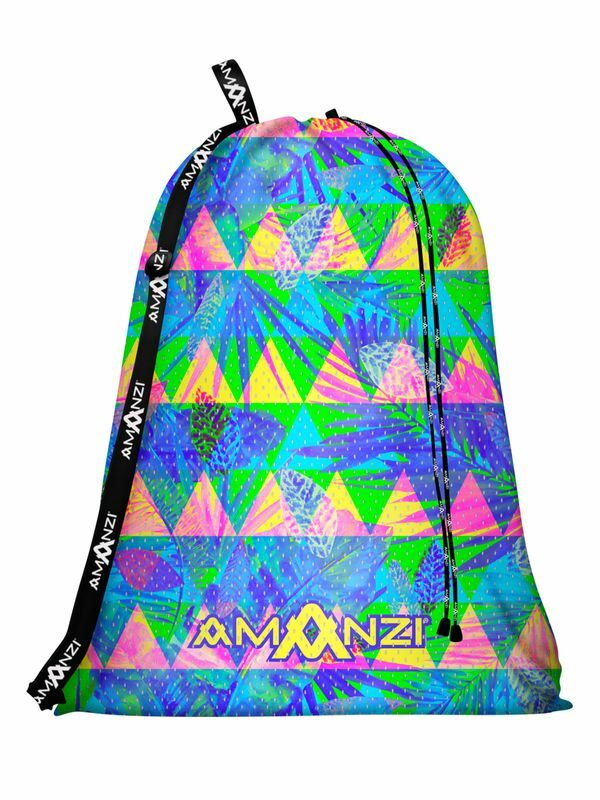 AMANZI was created to satify the needs of the fashion forward athlete with designs that are functional and highly durable. The team at AMANZI Swimwear understand that swimwear is not just something you swim in, it should also be a reflection of your unique style and personality. AMANZI puts a great deal of effort into their prints so that you can feel comfortable in your swimsuit and look great!